Summary:Photos missing from iPhone？As a matter of fact, it is not a rare incident. However, there is something you can do to get your missing photos back. This article will show you how to get your missing photos back from iPhone. How to Recover Recently Deleted Photos on PC? Summary:you can recover lost data by using easy data recovery recovery software with 30 days free trial and have no recovery amount limits. It recovers your files completely and quickly. Summary:This article recommends to you a free and powerful USB Flash Drive Recovery Software. You can try to retrieve deleted files easily or lost data from Kingston, Toshiba, SanDisk, Sony, and other Flash Drives or media devices. SD memory card is widely used on various portable devices, such as digital camera, mobile phone and multimedia player. Although it brings users great convenience, you may always find files suddenly lost on SD memory card and have no idea of why that happened. So you need to download a data recovery software for a memory card to recover lost files. Some people are searching for data recovery software for a memory card with crack for free download, which is illegal and unsafe. We don't recommend you to do that, because you might take many risks such as time wasting, device or data damage, virus attacks, and wasting your time when you start to try a pirated programs. As an alternative, we show you how to get free trial data recovery software for memory card or get a copyrighted memory card recovery software with discount Price. Even though it is not free, it is still a cost-effective solution for data recovery from memory cards, SD cards, and some other storage devices. Bitwar Data Recovery is a professional data recovery software that specializes in recovering deleted, lost, corrupted or formatted photos, videos, music and other files from storage devices like SD cards, Micro SD cards, Mini SD cards, XD-picture cards, CF cards, MMC, memory sticks, pen drives, USB flash drives, zip drives, floppy drives, etc. When you enjoy a file recovery tool full version crack, you have to take risks. 1. A lot of software with crack version usually exists on some pirated websites. Even if the crack version is on a legal site, there is no guarantee that the software is 100% safe. 2. All crack software is almost illegal. 3. Data recovery software free download with key probably contains a virus or bundled with some spyware or ads. When you install such a program on your computer, it apparently installs some other useless software at the same time which is difficult to uninstall or even corrupts the system or modifies the registry due to virus infection. Even worse, virus infection probably leads to further data loss. 4. Data recovery software free download with crack is usually cannot be upgraded, so you cannot enjoy other features as the full version being paid when the software has been updated. Who can guarantee that the data will not lose in the future? The registered version has unlimited benefits. The purchase lasts for a lifetime. Buying a discount price is very cost-effective. How to Recover Lost Data on the memory card with Bitwar Data Recovery? 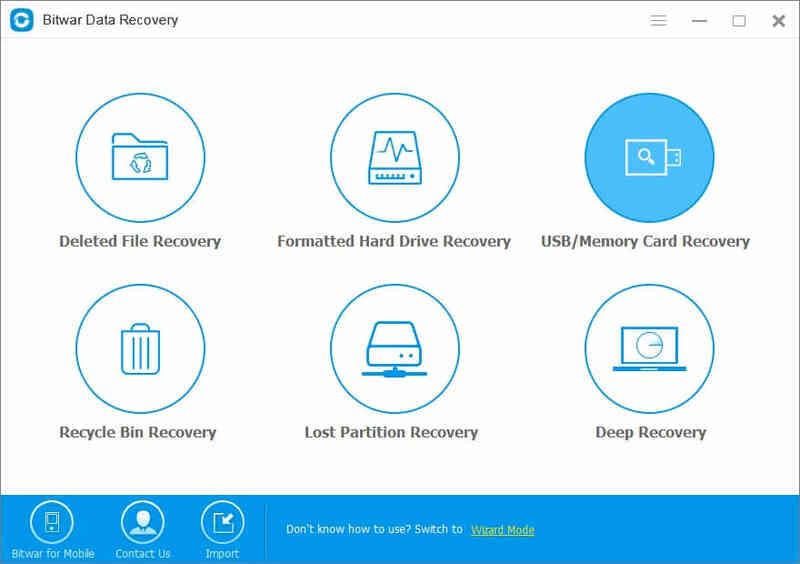 Launch the Bitwar data recovery program, select “USB/Memory Card Recovery” on the standard mode when you want to recover lost/deleted data from memory card. You can also select “Formatted hard drive recovery” When you want to restore data from the formatted memory card. Select the types of data you want to restore. You can also select "Select All Types." Then click “Next” to start scanning. After scanning, the found data will be displayed in the middle window area. You can preview them before recovery. And finally, choose those files you want and click "Recover" button to recover them back. Tips: you'd better save all the recovered files on the partition of the computer or different device. Please don’t keep them to the memory card until the recovery ends.